STARCRAFT (NZ) (Chestnut 2000-Stud 2006). 11 wins from 1400m to 2400m, Australian Derby, Gr.1. Sire of 454 rnrs, 254 wnrs, 15 SW, inc. Star Witness (MRC Blue Diamond S., Gr.1), We Can Say it Now, Hallowell Belle, Crafty Irna, Havana, Lunar Rise, Do You Think, Starcheeka, Celebrity Girl, Ain'tnofallenstar, Perfect Punch, Baschar, Don't Tell Mary, Mr Vadim, Singapore Sling, SP Crafty Cop, Petracca, Choose, Craftiness, Stella Lante, etc. EXCELORADA (g. by Exceed and Excel). 10 wins at 1000m, 1100m, A$351,990, WATC RS Crawford S., L, Summer Scorcher, L, Perthracing.com.au H., Italian Day at Belmont H., Azza's 20th Birthday H., Peter Rudland Diamond Jubilee H., Perth Racing Punters Club H., PR Festival Club H., Tabtime H., 2d WATC S., L, WATC RS Crawford S., L, Miller Genuine Draft H., 4th WATC Summer Scorcher, L.
Stellarcraft (g. by Starcraft). 4 wins. See below. Alborbrown (f. by Big Brown). 2 wins at 1750m, 2100m to 2015-16 in Aust. Rockorada (g. by Rock of Gibraltar). Winner at 1000m in Aust. Alborada Lady (f. by Rock of Gibraltar). Placed at 2, 3d Clairwood TC King's Pact S.
Red Pointes. 2 wins at 1900m, STC Tooheys New H., Rosehill Gardens Event Centre H. Producer. Malibu Style (Magnus). 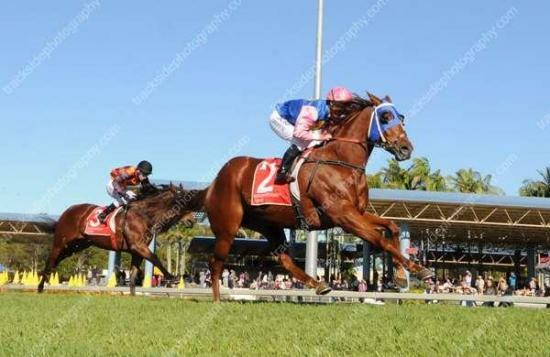 5 wins to 1300m, A$240,325, to 2015-16, WATC Westspeed Sprint H., Carlton Draught H., Del Basso Italian Day H., Perthracing.com.au H., 2d WATC Beaufine S., L, Placid Ark S., L, Westspeed H., Budget 50th Year Celebration H., 3d WATC Schweppes H., Pink Ladies Raceday H., Del Basso Smallgoods Nursery H., Amelia Park H., Racing #Ascothappens H., Perth Racing Instagram H., 4th WATC RS Crawford S., L.
Little Doutes (Redoute's Choice). 3 wins to 1400m, MRC Wiggle H., SAJC Owen Stanley Ranges H., 2d SAJC Cinderella S., L, MRC Dashing Eagle H., 3d MRC Impulsive H., Bint Marscay 2YO H.
Flokkati (Fastnet Rock). 2 wins-1 at 2-at 1000m, 1100m, A$152,838, MRC Harrolds H., 2d ATC James HB Carr S., L, MVRC St Albans S., L, Tattsbet.com 2YO H. Producer. Race Record: 29 Starts 4-2-8 A$59,200. 4 wins to 1200m to 2015-16, 2d Ipswich TC XXXX Good as Gold H., 3d BRC Brisbane Marriott Hotel H., Ipswich TC XXXX Gold Pale Ale H., Ray White H.